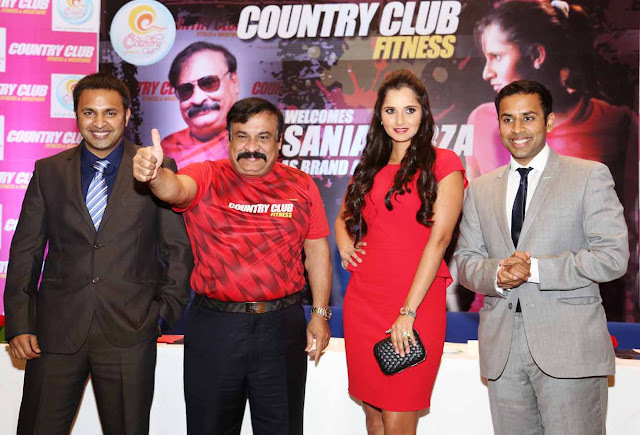 Mumbai,4th March, 2013: Country Club India Ltd (CCIL), India’s largest and fastest growing leisure and entertainment conglomerate has signed Tennis Superstar Sania Mirza as Brand Ambassador for CCIL Fitness & Vacations. At the media event held at Ballroom, Hotel Grand Hyatt, Mumbai on 2nd March 2013 the Tennis star Sania Mirza was present along with Chairman and Managing Director Mr. Rajeev Reddy CCIL, Mr. Siddharth Reddy, CEO and Mr. Varun Reddy, COO CCIL. CCIL has recently expanded and diversified its product and services portfolio being offered to its members by tapping into the Health and Fitness Market. CCIL has already launched fitness centers at Juhu, Thane, Phoenix Market City Kurla, R City Mall Ghatkopar, Ahmedabad, Chandigarh, Phoenix Market City Pune, Jaipur, City Center 2 Mall Kolkata, Empress Mall Nagpur, Kasba Kolkata and City Square Mall Delhi. This is all part of CCIL’s Rs 350 crores expansion plan that aims at creating more than 100 fitness centers across Indian & abroad. CCIL, who has always been on the pioneer in the market, has already introduced Zumba and Pilates in its fitness Centers, which are equipped with state of the art equipment and well qualified trainers. “Sania Mirza represents the perfect combination of fitness and family. Country club has been stressing on fitness and vacations for its families of 3.5 lakh members. With Sania coming on board, we wish to drive the message with a lot more passion. Sania lends her trademark ebullience and freshness stemming from her success in everything that she sets out to achieve. It’s her never say die attitude so very synonymous with country club that drives us further, Mr. Reddy added. Apart from India, CCIL currently has operations in Middle East, Sri Lanka & Thailand. It owns and operates over 50 clubs across India & abroad and 12 fitness centres and more under fit outs having over three lakh and fifty thousand members. CCIL provides innovative Holiday Packages, Health & Wellness and Fitness centers, State-of-the-art Club Houses, Leisure & Entertainment facilities including Star Studded Events, lounge bars, multi-cuisine restaurants, indoor & outdoor games, business centre and other facilities across its properties.